Why the MBA’s a team sport…. 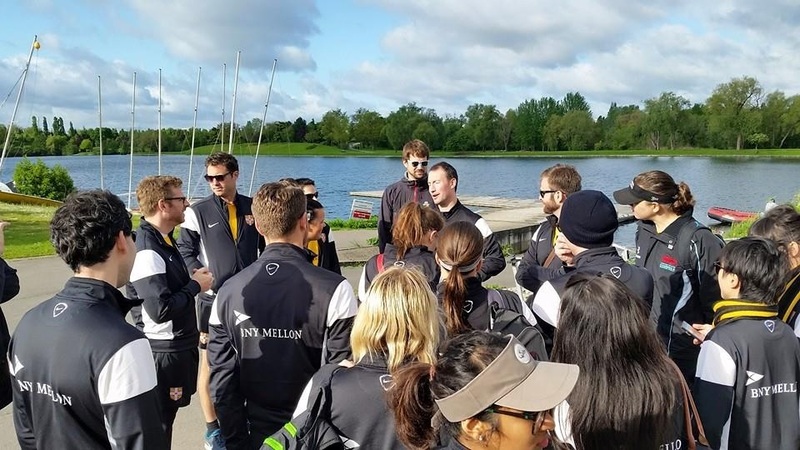 I first learned of the MBA sports Tournament – MBAT – in the summer before I started studying at Cambridge. Through various internet searches while researching student activities in which to participate, I came across the official website for the largest MBA event in Europe, hosted by HEC. Three days of sports competition, themed parties each night, networking throughout, and a chance to see the French countryside – I was hooked. The MBAT became a big part of my platform in running for Co-Sports Chair of the Business School Club (CBSC) here at the business school, though I had started drumming up interest in the event long before votes were in. One of my proudest accomplishments this year has been managing Cambridge’s participation in the 25th MBA Tournament. Co-Sports Chair Raul Lopez Petisco and I spent months organising the Cambridge team, spearheading travel, visa, hotel, equipment, sports team, and social event planning. We even had a couple Skype calls between Spain and Thailand during our Global Consulting Project to discuss sponsorship details. What felt at times like a fulltime job was truly an exercise in organisation, communication, and creativity. Raul and I were able to put into practice a lot of what we learned during the MBA – people management, accounting, even branding – while also applying some more unique learnings – e.g. effective communication to a big group of people and creative ways of empowering others. When it came to the tournament, MBAT exceeded my high expectations. Despite a few schedule changes and logistical challenges, the sport competitions were fun to watch and even better to participate in, the parties were great, and the spirit phenomenal. I competed in swimming which was certainly the highlight of the MBAT for me. The atmosphere in the pool was energising and kept up the entire afternoon. Each night boasted a different theme and event – Casino Royale with live Blackjack final where Cambridge occupied two of eight final seats, 90’s Battle of the Bands when our own MBAND came in second, and Tex-Mex on the final night with the Salsa competition when Cambridge came in third. But it was the spirit of the games that impressed me most. There was a variety of experience and talent in each competition. The important thing to Raul and me was that participation was more important than talent – we wanted people to try a new sport, join a team even if they were unsure, and have fun doing it – and we were delighted to find that this perspective generally was shared by other schools. In nearly every game there were green players, individuals struggling through a new sport, and in each instance they were cheered on by the crowd, often more emphatically than the applause for more seasoned competitors. In the pool a young man from another school was having an exceptionally difficult time finishing his 50 meter race and, when he was the last swimmer still in the pool, every swimmer competing that day circled the edge and we all clapped and shouted until he touched the end when the competitors erupted in cheers. What a beautiful tribute to the vulnerability and enthusiasm that new sportsmen and women brought to these games. I was proud to represent Cambridge, not only because of our performance but also the support shown to fellow classmates. Each time CJBS began to compete in a new game, the news was communicated and a flock of cheerers headed to the field. There was a steady and energetic haze of black and gold to be found shouting for our colleagues at each competition. The comradery and excitement were infectious. I encourage everyone in future classes to get involved, to attend the MBAT and to participate in some competition. It is a great way to network with other schools, a really fun weekend, and most importantly a great bonding weekend with your fellow classmates.